A larger version (164kb) is here. A second Jupiter-sized planet has been detected orbiting 47 Ursae Majoris, a star similar to the sun. In a striking parallel to our solar system (bottom), both Jupiter-size planets are in nearly circular orbits around their star (top). The diameters of the sun, the star and the planet orbits are not to the same scale. A team of astronomers has found a Jupiter-size planet in a circular orbit around a faint nearby star, raising intriguing prospects of finding a solar system with characteristics similar to our own. The planet is the second found to orbit the star 47 Ursae Majoris in the Big Dipper, also known as Ursa Major or the Big Bear. The new planet is at least three-fourths the mass of Jupiter and orbits the star at a distance that, in our solar system, would place it beyond Mars but within the orbit of Jupiter. "Astronomers have detected evidence of more than 70 extrasolar planets," said Morris Aizenman, a senior science advisor at the National Science Foundation (NSF). "Each discovery brings us closer to determining whether other planetary systems have features like those of our own." "For the first time we have detected two planets in nearly circular orbits around the same star," said team member Debra Fischer of the University of California at Berkeley. "Most of the 70 planets people have found to date are in bizarre solar systems, with short periods and eccentric orbits close to the star. As our sensitivity improves we are finally seeing planets with longer orbital period, planetary systems that look more like our solar system." The planet-search team, which is supported by NSF and NASA, has been instrumental in finding a majority of the extrasolar planets. Besides Fischer, the team includes Geoffrey Marcy, also of Berkeley; Paul Butler of the Carnegie Institution of Washington; Steve Vogt of the University of California at Santa Cruz; and Gregory Laughlin of NASA's Ames Research Center. Their report on the new planet has been submitted to Astrophysical Journal. A few years ago, Marcy and Butler discovered a planet more than twice the mass of Jupiter in a circular orbit around the same star. The star is one of 100 that the scientists have targeted since 1987 in their search for evidence of extrasolar planets. They use the 3-meter and 0.6-meter telescopes at the University of California's Lick Observatory to measure Doppler-shifted light reaching the earth from stars. Regular changes in the Doppler shift, they believe, signal the presence of a planet periodically pulling the star toward or away from Earth. Fischer was able to see the periodic wobble from the second planet, smaller and farther from the star than the first, because of improved instrumentation that can measure motions as small as three meters per second. The star is a yellow star similar to the sun, probably about seven billion years old and located about 51 light years from Earth. "Every new planetary system reveals some new quirk that we didn't expect. 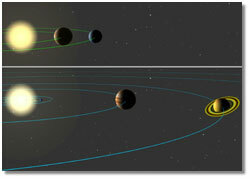 We've found planets in small orbits and wacky eccentric orbits," said Marcy. "With 47 Ursae Majoris, it's heartwarming to find a planetary system that finally reminds us of our solar system."